Naoto has been spoiling me by filling our liquor cabinet with bottles of booze that have been on my wishlist for a long time. Last weekend it was Chartreuse, this weekend it was dark creme de cacao (among others which shall be shared soon). 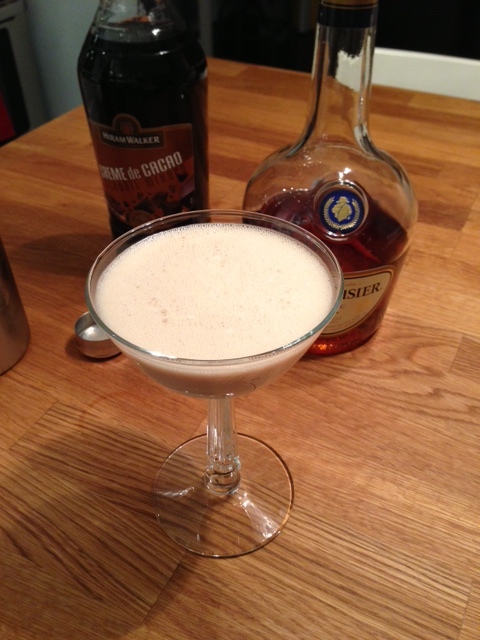 I’ve been talking about making a Brandy Alexander for a long time and this weekend I finally did. Do you ever enjoy after-dinner drinks? When I was little, I remember my grandma ordering a Grasshopper after a family dinner at the Duck Inn. It was so green and pretty that I couldn’t wait to grow up and try one. When I was in my twenties, I ordered one at a restaurant and the bartender had to look it up in a book before he could make it…I had no idea it was so old-school! In spite of being a grasshopper-making novice, he managed to make a deliciously minty-rich cocktail. On Saturday, after a quick trip to Michaels to pick out more frames for the rest of the artwork floating around here, I invited the neighbor ladies over to try a Brandy Alexander with me. In a shaker filled with ice, add brandy, creme de cacao and half-and-half. Shake until chilled and pour into cocktail glass. Garnish with nutmeg. Enjoy with your neighbors on a chilly winter night. The Brandy Alexander was a hit, but we could only drink one–it’s rich and dessert-like…so Naoto opened up a bottle of wine and made up this fancy snack for us to enjoy. (Sorry for the weird angle of the cell phone picture!) 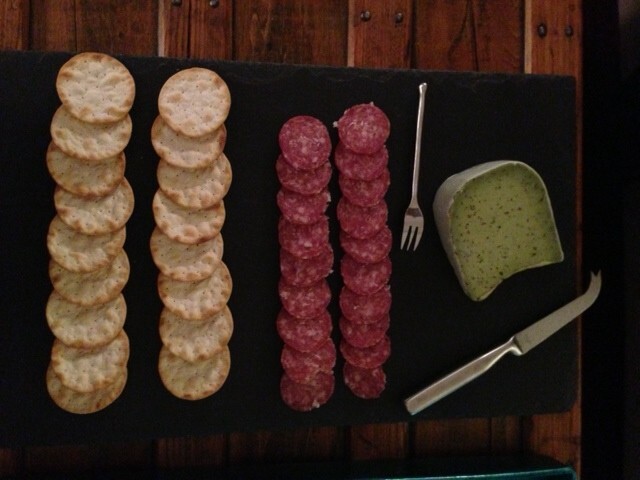 The green cheese is a pesto gouda from Trader Joe’s–perfect for St. Patrick’s Day and so tasty! This week, I am going to finish off the spare room and hopefully get the rest of the frames off of the floor. It’s supposed to snow six more inches tomorrow, so I have a good excuse to stay home and tackle my March to-do list. Maybe I’ll have some progress to share soon!